Congratulations Deborah Pinnock, Bhagawati P Parmar, and Bruce Pockey for winning our club’s Table Topic impromptu speaking contest. This contest tests the ability to respond to a question or prompt not of the speaker’s choosing. Contestants were led into the room one at a time and presented with a simple prompt: “To Be.” Here’s what they did with it. Impromptu speaking is one of the most valuable skills we practice in Toastmasters, useful in countless real life situations where the ability to “think on your feet” is important. Club Awesome’s weekly meetings almost always feature a more informal Table Topics contest. 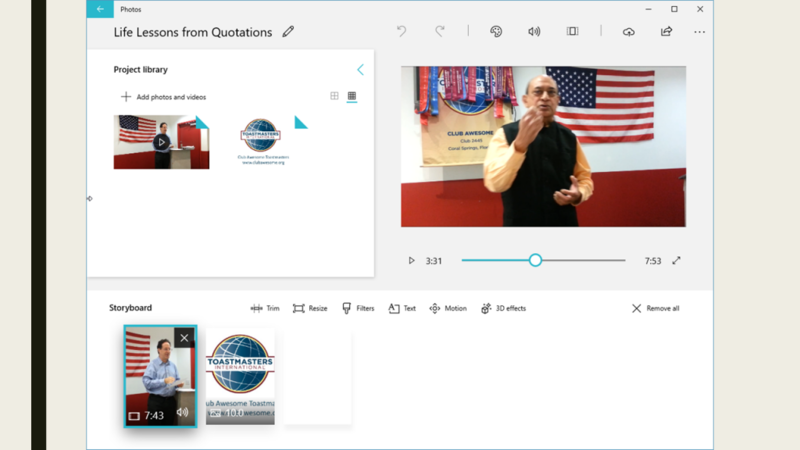 A lot of the editing you might want to do with the video of a speech is possible with free tools like Windows Photos / Windows Video Editor, Google Photos, or Apple’s iMovie. 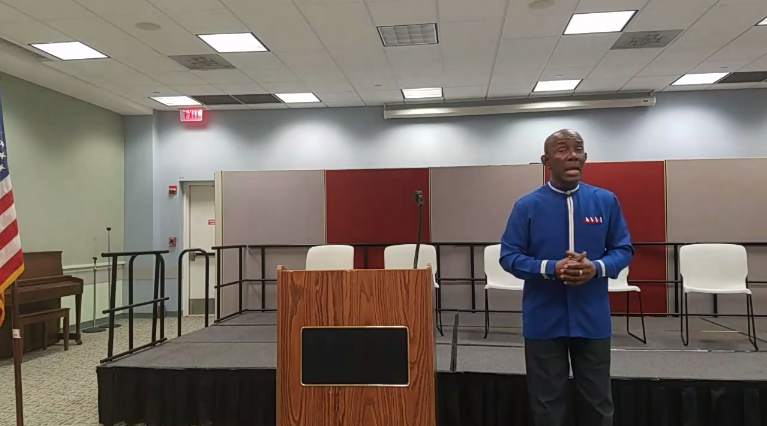 I’m telling the story of how to do it in two videos, one of my speech about video editing at Club Awesome, and a second video that my friend Chris Guld of GeeksOnTour.com is allowing me to share for Toastmasters educational purposes. If you’re interested in digital photo editing and other topics of particular interest to travelers, I recommend that you subscribe to her complete library of video tutorials. I frankly wasn’t aware that there was a video editor in Windows 10 until I saw Chris’s tutorial, but now that I know about it I plan to use it for a lot of simple speech editing tasks. Because I wanted to do some fancier editing of the recording of my own speech, splicing in images of the slides I used, I created the video below using a commercial tool, Camtasia. I probably also could have done it in Apple’s iMovie. Both of those allow you to edit multiple tracks of audio and video. As you will see in the tutorial, the Windows video editor uses a simpler “storyboard” metaphor — but does a good job of allowing you to accomplish basic video trimming, cutting and splicing tasks. You can also add titles and even 3D effects. More than promoting any one tool, I hope to communicate the basic principles and get you thinking about the possibilities. First, here’s my speech video to set up the topic. I shared the video below in the middle of that speech, so you’re getting the replay slightly out of order. This will make the “how to” of video editing a lot clearer. Geeks on Tour tutorial on video editing. Chris Guld’s tutorial isn’t specifically about editing a speech video — her example is a video of a dance party — but she does a great job of showing how to edit the timeline of a video to remove any unwanted bits at the beginning, at the end, or in the middle. That includes removing errors, like in her case the moment where someone walked in front of the camera while she was recording. Chris discusses the video editor as a feature of Windows Photos, and I subsequently found another tutorial on the “hidden” video editor in Windows 10. If you have the current update to Windows 10, Microsoft added a “Video Editor” app — which appears to be just a shortcut for accessing the same tools in Windows Photos. Another way you could use this tool is to combine clips from several videos — either the best moments or the bloopers — into a single video. 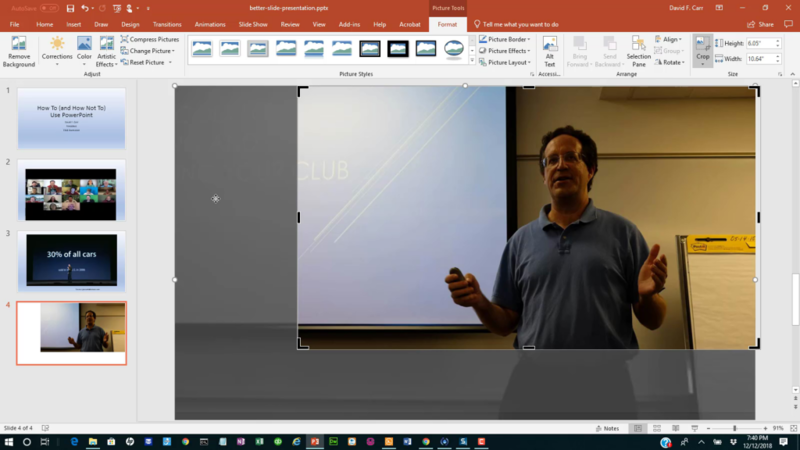 Or you might use a clip from a video of a live speech as the introduction to a subject, followed by an explanation of the details produced using PowerPoint’s recording feature. Now go forth, create, trim, and share! 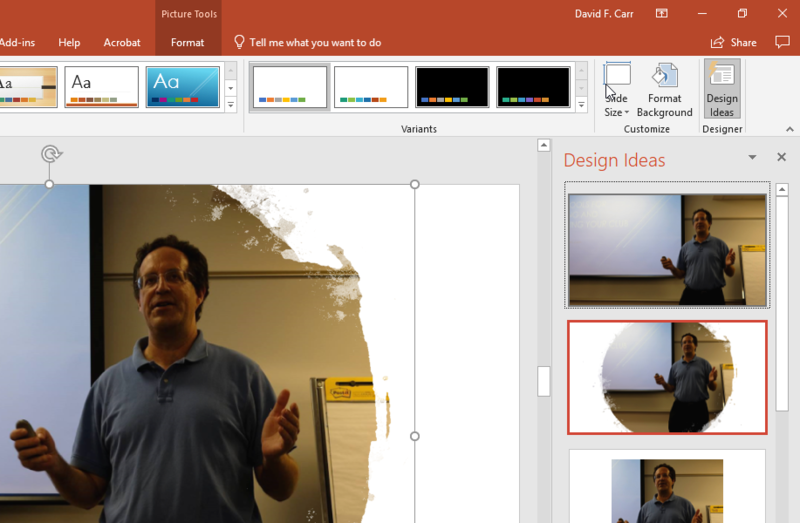 Did you know that you can create simple videos with nothing but PowerPoint? The recording feature lets you advance through your slides while adding narration. Optionally, you can toggle on your webcam (your face will appear in the bottom corner of the image). You can then export from PowerPoint to a standard MP4 video file. For many purposes where you want to deliver a message on video, powered by your voice and a few well-chosen images, this might be all you need to create something that’s sharable on YouTube or social media. Or you can use this as a way of producing a video clip to be edited and combined with other clips into more elaborate productions. This is a presentation about how to use PowerPoint effectively and some common pitfalls to avoid. Some of this advice applies to other presentation technologies like Google Slides, but I’ll be sharing technical tips specific to PowerPoint. We should start by understanding there are good reasons not to do a computer slideshow. Technology can fail you at the worst possible moment and often does. As a guest speaker, you may find that the projector doesn’t have the right plug to fit your computer. If your slides are important, make sure you’re clear on whether your host wants you to use your computer or theirs – and if they want you to use theirs, I would still bring my own laptop as a backup. Show up early and test everything so you know if you have a problem and have time to solve it. On the other hand, Club Awesome members often come to me saying, “I just want to show a few pictures” or “just project this document on the screen and scroll down for me.” In those situations, you would make yourself look better by organizing the information in a PowerPoint deck and advancing through it with a handheld clicker. A speaker should know how to use PowerPoint, but make sure you are using it to enhance your speech. If you don’t make it work for you, it’s likely to work against you. One strong temptation is to use PowerPoint as a crutch, an electronic outline to remind yourself of what you want to say. If you’re reading your slides, what value are you adding for your audience beyond the message you could have delivered in an email. If you have complicated to information to share, create a handout. The handout can parallel the information you present live, but a printout of your slides is often the least effective handout you can provide. Design reading material to be read, but make your slides part of the experience you are delivering. If you need to share web links — particularly long, complicated web addresses — put that in a follow up email or a blog post where people can click rather than click on the links rather than typing them. Sharing a very simple web address (or Twitter handle) on screen is different, if you can use that as a gateway to the richer information you want to share. If my tips on resizing and cropping images go by too fast for you in the video, check out this blog post by the author of a book on PowerPoint. The basic point I’d like to get across is the difference between resizing images which you do by clicking and dragging on the corners of the image and cropping images, which means you’re cutting away parts of the image that you don’t want to be displayed. Resizing is the default when you click on an image, you can click and drag to reposition it. The resizing “handles” that look like little bubbles will be displayed at the corners of the image. To resize images proportionally, put your mouse on the corner handles before you click and drag. DANGER: Beware of stretching or squishing images, which can be easy to do if you drag the resizing handles from the top, bottom, or either side. One way to switch to cropping mode is to right click on the image and choose Crop from the menu that pops up. In cropping mode, the handles at the edge of the issue turn into square angles that you drag toward the center of the image from the top, bottom, left and right until you get the shape you want. Although the programmers behind PowerPoint try to divine your intentions and helpfully present the right menus and options, sometimes you have to hunt for them. Here are a few key menus to know your way around. The insert menu for pictures but also text boxes and drawing objects. 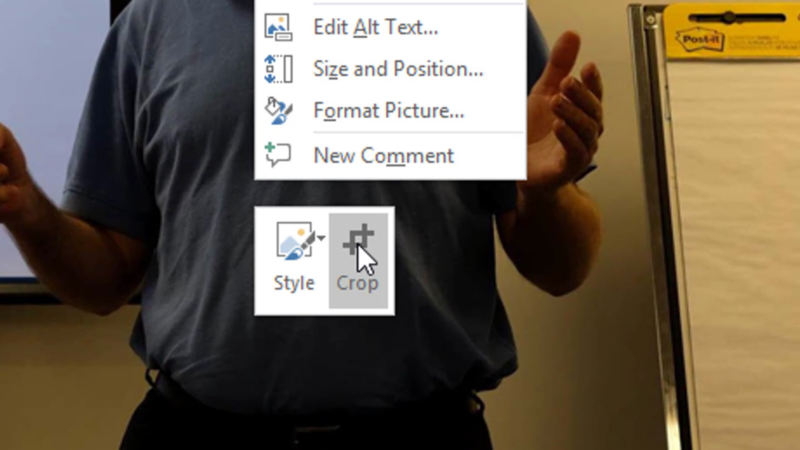 Notice that this Picture Tools button bar also includes a Crop option, with more options than were shown when I right clicked on an image. For example, “Crop to Shape” will let you crop an image to a star or an octagon, rather than a rectangle. In the video, I showed PowerPoint volunteering design ideas for formatting a picture. If you don’t want to wait for that to happen spontaneously you can click on the Design tab and pick Design Ideas to prompt the software to make some suggestions. From Seth Godin, a world class marketing expert, check out these tips on “How to fix your really bad PowerPoint.” One of his rules: no more than 6 words per slide. As in: kill those long lists of bullet points. The ugly slide examples in my presentation are from a Vice article, The Pentagon Has the Worst PowerPoint Slides You’ve Ever Seen and the blog of a speech coach who in turn pointed me to the TED talks blog mentioned above. 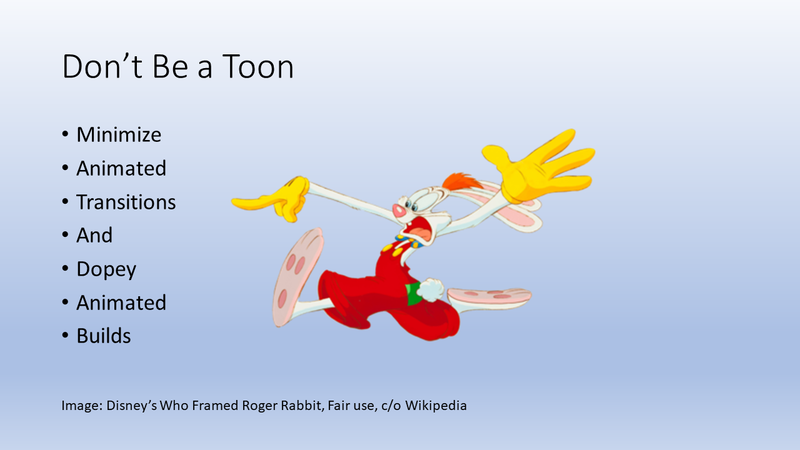 Legally Using Images in Your Presentations from Copyright.com. Creative Commons Search – find images shared with “some rights reserved” (for example, requiring attribution of the artist or photographer). Many images on services like Flickr are shared this way. From our “Table Topics” impromptu speaking exercise on Aug. 24.